Death is never something we want to think about, or talk about. It doesn't matter if it's the death of a family member, close friend or even a pet. What about the death of a church? Really, that is just as painful. It's always sad when a church closes it's doors. We all know that churches are more than buildings. They are more than the furnishings, and sound equipment and pianos and organs. Churches are made of people. Often when the churches close their doors, people drift away from each other, relationships and friendships fade away and the church becomes a long ago memory. Often the church's death took place so slowly over an extended period of time. All that is left after the doors close are the memories It's sad. 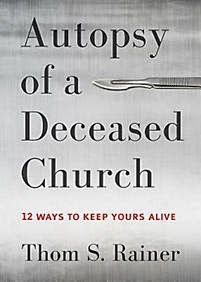 Dr. Thom Rainer tells of fourteen church autopsies -- not all in detail, but a summary of all fourteen deceased churches. The book is divided into two sections: the first is the introduction and the autopsy where several traits that deceased churches have, so that we can guard against them in our own churches. The second section; the final three chapters is devoted to finding hope for churches that are dying by providing twelve responses for for churches that may have the symptoms of the churches that were autopsied. These will help you recognize if your church has the symptoms, is sick or already dying. These are twelve ways you can keep your church alive! For over 25 years, Dr. Rainer has served as a pastor, seminary professor, church consultant and is now the President and CEO of LifeWay resources. He has an abundance of experience with churches of many sizes, demographics, denominations and locations. He's been part of churches, he's helped churches, led churches and as we see in the book he has performed autopsies of dead churches. His experiences and wisdom can help us protect our own churches against the pitfalls and characteristics of dying churches. I recommend this book for anyone committed to the health of your church; church members, lay leaders and church leaders alike. It's a must read -- we must protect our churches! Autopsy of a Deceased Church from Faceout Studio on Vimeo. Thanks to Broadman & Holman for allowing me to review this book. It was provided to me without promise of a positive review, and these words are my honest thoughts and opinions.